WASHINGTON (CNN) -- Anti-American sentiment in Arab nations may be at a historic high, but Secretary of State Condoleezza Rice was the honorary recipient of more than a quarter of a million dollars in jewelry from an Arab leader over the past year. 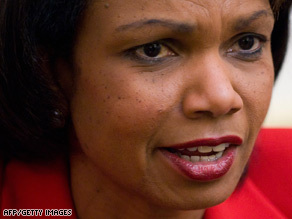 Secretary of State Condoleezza Rice received gifts of jewelry, but federal law mandates they go to archives. Saudi Arabia topped the State Department's annual inventory of gifts to top administration officials. In July King Abdullah presented Rice with a ruby and diamond necklace with matching earrings, bracelet and ring worth $165,000. Earlier in the year, in January, the Saudi king presented Rice a $147,000 emerald and diamond necklace, bracelet and earrings set. The State Department originally reported that the emerald and diamond jewelry set came from Jordan's King Abdullah, but the Jordanian government pointed out such a gift was never made by the Jordanian king. "No such gift was given to Secretary Rice from HM King Abdullah II," the Jordanian Embassy in Washington said in a statement. "We believe this must have been a mistake on the part of the State Department. Gifts by HM King Abdullah II to U.S. officials are always symbolic and of little material value." The State Department acknowledged and apologized for the error. "Our records indicate that the King of Jordan did not give Secretary of State Rice the emerald and diamond and jewelry set (ring, bracelet, necklace and earrings)," said Noel Clay, a State Department spokesman. "She received this jewelry set from the King of Saudi Arabia," he said. "We regret this error and will correct and resubmit the federal register. The United States counts both Saudi Arabia and Jordan among its most important partners." The gift list, prepared by the State Department's Office of Protocol, itemizes all presents to top administration officials. The recipients do not keep them, as they are turned over to government archives in accordance with federal law, which prohibits officials from accepting personal gifts. President George W. Bush and first lady Laura Bush also were remembered by their Arab friends. The Saudi king gave the first lady an $85,000 sapphire and diamond jewelry set and a $10,000 piece of artwork made of gold, depicting a desert scene of Bedouins, camels and a tent. The first couple also received embroidered pillows with the names and pictures of the first dogs, Barney and Ms. Beazley. The pillows were given to Laura Bush by the wife of former Japanese Prime Minister Shinzo Abe. The gifts range from the extravagant -- like the jewelry -- to the modest -- a $6 assortment of nuts and dried fruit given by the Dalai Lama to Laura Bush -- to the downright odd, like the Abs Exerciser given to President Bush by the prime minister of Singapore. Many of the gifts are related to the recipient's post. Defense Secretary Robert Gates received an Arab knife valued at $3,200 from the Bahraini government. Despite Russia's tensions with the United States over Georgia, U.S. Gen. Peter Pace, the former chairman of the Joint Chiefs of Staff, received a machine gun from his Russian counterpart. The source of gifts to U.S. intelligence officials is classified, but CIA chief Michael Hayden raked in $8,000 in gifts, including a gold cow plaque, a silk rug and a strand of pearls.